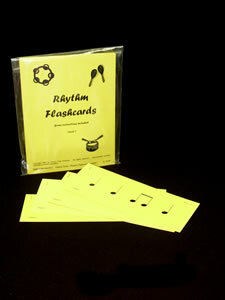 Rhythm strip flashcards (4 ¼ x 11) and time signature cards big enough to see in a small classroom or other small group are now available on colorful card stock in 3 levels (color-coded by level). Game instructions are included for “Base the Rhythm on the Beat” – a rhythm game that drills how to create, count and clap rhythms! Cards have a varnish coating to guarantee years of use! Level 1 includes drills with quarter note, quarter rest, half note, half rest, dotted half note, two 8th notes (beamed) with time signature cards of 2/4, 3/4 and 4/4. Over 40 strips.